GFCI Tower Manufacturing 2' Length, 15 amp In-Line GFCI And Triple Tap Cord Set With Auto ResetThe two-foot Tower Manufacturing 15-amp 125V cord set has a three-prong National Electrical Manufacturers Association (NEMA) 5-15P plug to connect to grounded outlets, and provides three grounded NEMA 5-15R taps to plug in electrical tools and devices. Its safety yellow color is for high visibility, and the cord set complies with Occupational Safety and Health Administration (OSHA) standards for safety at construction sites and in industrial environments. 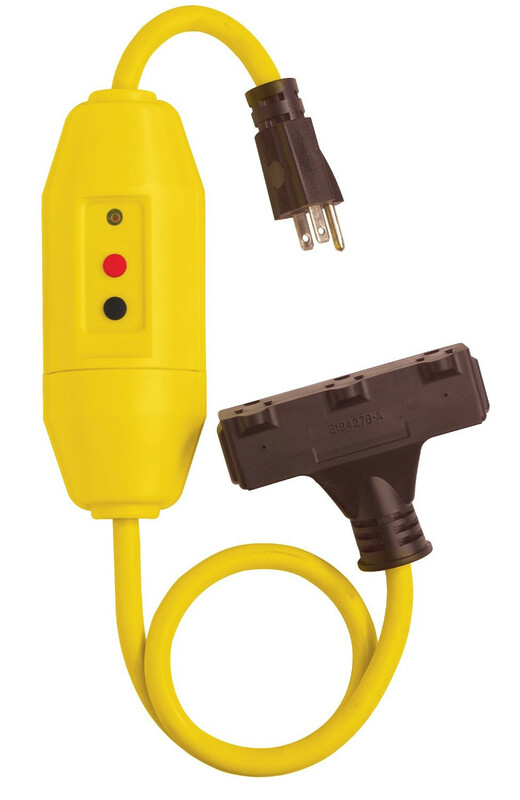 The cord set comes equipped with an inline ground fault circuit interrupter (GFCI), which disconnects a circuit upon detecting an unbalanced current for increased safety, and it automatically resets for ease of use. An LED indicator informs users when the power is on. The 12/3 American Wire Gauge (AWG), Standard Junior Thermoplastic with weather-resistant jacket (SJTW) cord is durable and rainproof for both outdoor and indoor use. The cord set meets Canadian and United States Underwriters Laboratories standards for quality assurance.Tower Manufacturing makes electromechanical devices such as ground fault circuit interrupters (GFCIs), appliance switches, thermostats, and controls. The company, founded in 1957, is headquartered in Providence, RI.